Why Choose Four Seasons Property Inspections? 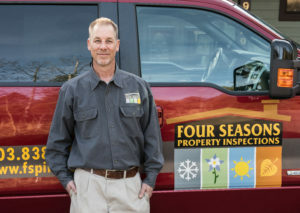 Four Seasons Property Inspections serves the greater Denver metro area, and has great customer reviews on Yelp, and Google+. We are very proud of our A+ Accreditation at the Better Business Bureau. Call us when you’re purchasing a new home and need a quality and detailed home inspection. It contained everything you spoke to me about on the day it was done, no surprises. Thank you for being so thorough and honest, and for taking the time to answer all my questions. Hi Phil, I go the report and the radon test results. Thanks so much for your help I feel like no only do I know what the things are to be aware of in this property, but how to move forward on them. Wow, what a great job you did. The report was easy to read and understand. Thanks for explaining so much to me in person. You really are easy to work with. I will definitely refer you to my friends. Four Seasons provided me with a report, detailing the health of my house. The report helped answer prospective buyers questions about my home, which intimately helped to sell my home fast and at the price I was asking.